Spring Window Tree This item is on sale. FROM STORE OVERSTOCK, NEVER USED...Out of print chart is in EXCELLENT condition, with no markings of any kind and price sticker on front cover. From Fanci That, published 2004. FROM STORE OVERSTOCK, chart is in EXCELLENT condition, never used, with price stickers on front cover. Contains 6 spring time ornaments, including Birhouse, Bunny in a Basket, Flower Basket, Spring Window, Girl Bunny, and Boy Bunny. Spring Woolies This item is on sale. FROM STORE OVERSTOCK, NEVER USED...From SamSarah Designs, both fun designs were stitched on 20ct Lugana (Lime Green & Dresden Blue - stitch count: 43 x 89) using Weeks Dye Works #5 Perle cotton, embellished with buttons from Just Another Button Company and finished as a 'pocket in hand-dyed wool' from Weeks Dye Works. The patterns for wool shapes and finishing instructions are also included! Springtime In The Village-Welcome Spring - Sampler Kit This item is on sale. FROM STORE OVERSTOCK, NEVER USED...From Pine Mountain, celebrate the springtime with this design! The chart pack CONTAINS 32ct Lambswool linen and the pattern. You supply the DMC floss used and needle. Springtime of Youth Sampler This item is on sale. FROM STORE OVERSTOCK, NEVER USED...From Chessie & Me, this sampler designs incorporates several specialty stitches and a favorite verse. Stitched on 32 count Vintage Meadow Rue linen from Lakeside Linens using Gloriana silks. Stitch count is 81 x 125. Sprinkle Your Day This item is on sale. St. Nick Folio This item is on sale. From Shepherd's Bush, chart is in EXCELLENT condition, appears never used, with no markings of any kind. St. Nick's Noel w/ Embellishment Pack This item is on sale. 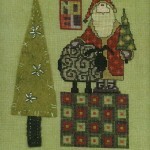 FROM STORE OVERSTOCK, NEVER USED...From Amy Bruecken, Santa and his Sheep are ready for the Holiday on 30ct Guacamole linen with a stitch count of 50 x 110 (Santa and Sheep stitched only).. BUT IF you use the embelishment pack with Wool Tree and beads, the stitch count is really 90 x 110. Uses Weeks Dye Works and Sampler Threads or DMC floss. Stack o' Santas This item is on sale. From Leisure Arts, Leaflet 2216, out of print chart is in EXCELLENT condition, appears never used, with no markings of any kind and minimal writing on front cover. Stack Of Snowheads, A This item is on sale. FROM STORE OVERSTOCK, NEVER USED...From Thistles, punch needle design using the 3- strand needle shown on weavers cloth, using Weeks Dye Works or DMC floss. Finished design size is approximately 6 x 12. You trace the design on for punching. Stacked: Merry Halloween Vintage Pumpkins This item is on sale. FROM STORE OVERSTOCK, NEVER USED...From Hinzeit, stitch a stack of vintage jackolanterns; the 8 glass beads used are included! Stitched on 28 count Lambswool Jobelan using DMC floss. Stitch count is 195 x 45. Stamp Flip-It December This item is on sale. SHOP OVERSTOCK .. From Lizzie Kate and the final edition of the 2005 series - Flip-It Stamps ... this warm wintry mitten is embellished with 3 tiny cream-colored buttons. Stitched on 28ct Light Mocha Cashel linen using Gentle Arts Sampler Threads & Weeks Dye Works (conversions to DMC/Anchor provided) with a stitch count of 47W x 47H. Stand Proud This item is on sale. FROM STORE OVERSTOCK, NEVER USED, in EXCELLENT condition...From Imaginating, stitched on 14 count White Aida using DMC floss. Stitch count is 107 x 109. Standard Of Grace This item is on sale. FROM STORE OVERSTOCK, NEVER USED...From Erica Michaels and her Petites Collection, the chart pack contains the 40ct Silk Gauze, full page charts with clear stitching instructions and tips. It's easy - you CAN do this! Star Of Hope This item is on sale. Star Stocking This item is on sale. FROM STORE OVERSTOCK, NEVER USED...From Erica Michaels, out of print chart is in EXCELLENT condition, with no markings of any kind and price stickers on front cover. Starflower Sampler This item is on sale. FROM STORE OVERSTOCK, NEVER USED...From Summer House Stitche Workes, this sampler is just a bit different from the everyday. Designed by her daughter Laura, it features a backstitched lattice border, adorned with “star-stitched” flowers. Includes chart for adouble-sided biscornu. Stitched on 36ct Lambswool linen using DMC floss. The frame is from Priscilla’s Pocket. Starlight Oasis This item is on sale. FROM STORE OVERSTOCK, NEVER USED...From Cindy Valentine Designs, out of print chart is in EXCELLENT condition, appears never used, with no markings of any kind and price stickers on front cover. Stars & Borders This item is on sale. FROM STORE OVERSTOCK, NEVER USED...From Thistles, stitched on 28 count linen using Crescent Colours. Stitch count is 157 x 157. Stars & Stripes Santa This item is on sale. Stars and Stripes Forever This item is on sale. FROM STORE OVERSTOCK, NEVER USED...From JBW Designs, chart is in EXCELLENT condition, with no markings of any kind and price sticker on front cover. Start Where U Stand Sampler This item is on sale. FROM STORE OVERSTOCK, NEVER USED, chart is in EXCELLENT condition. From Bent Creek, stitched on 32 count Lambswool or Flax linen using Gentle Art Sampler Threads, Weeks Dye Works, and Crescent Colours. Stitch count is 75 x 107. Button pack is included. Stash-O-Holic This item is on sale. FROM STORE OVERSTOCK, NEVER USED, in EXCELLENT condition...From X's & Oh's .. what a fun name badge for your next stitch group night! Shown on 28ct White Jobelan using DMC floss, the stitch count is 58 x 40. Script alphabet in upper and lower case for personalization is included. Statue of Liberty, The This item is on sale. FROM STORE OVERSTOCK, NEVER USED...From Kind Stitchworks, out of print chart is in EXCELLENT condition, with no markings of any kind and price sticker on front cover. Steam Punk Sea Serpent This item is on sale. FROM STORE OVERSTOCK, NEVER USED...From Samsarah, whether you're into 'steampunk" or just plain fun .. our Sea Serpent is stitched on 32ct Parchment linen with lots of fun details using Weeks Dye Works floss, embellished with colorful buttons, and sewn to finish and shown placed on an 8" Gears split-bottom Wire Hanger.